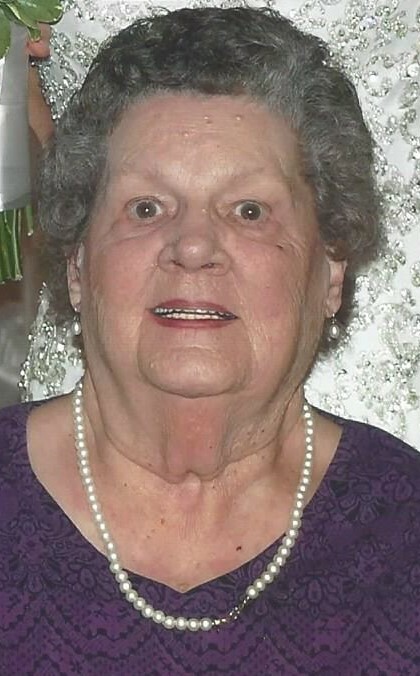 Barbara Jean Millburg, 87, of Morrisonville, IL, passed away at 1:47 p.m. on Saturday, April 21, 2018 at Memorial Medical Center in Springfield, IL. Barbara was born April 14, 1931 in Springfield, IL, the daughter of Vincent and Maria (Jones) McKinney. She married Glenn E. “Kelly” Millburg on January 10, 1952 at Ss. Peter & Paul Catholic Church in Springfield, IL. Glenn preceded her in death on May 22, 1993. Barbara graduated from Morrisonville High School in 1949. Following high school, she worked for a short time as a secretary for the Illinois Department of Highways, before becoming a homemaker and the CEO of the Millburg Household. Barbara was a member of St. Maurice Catholic Church, the St. Maurice Altar and Rosary Society, and a past member of the Morrisonville Foresters group. She enjoyed BINGO, reading, jigsaw puzzles, and watching gameshows, especially Wheel of Fortune, Jeopardy, and Family Feud. She was also preceded in death by her parents; grandson, Adam Millburg; sister, Nancy Drury; and brother, Jim McKinney. Barbara is survived by her children, Joe Millburg of Springfield, IL, Jean (husband, Walter) Williams of Hillsboro, IL, Mike (wife, Denise) Millburg of Morrisonville, IL, Mary (husband, Bobby) Hunt of Litchfield, IL, Patty Nail of Collinsville, IL, Margie Mettler of Littleton, CO, and Paul (wife, Kelly) Millburg of Taylorville, IL; 17 grandchildren; 17 great grandchildren; sisters, Rose, Janet, Donna, Terry, and Karen; and several nieces, nephews, and cousins. Visitation & Prayer Service: The family will receive guests from 4:00 – 7:00 p.m. on Monday, April 23, 2018 at Perfetti-Assalley Funeral Home, 304 Carlin St., Morrisonville, IL 62546. The visitation will be begin with a prayer service. Funeral Mass: 10:00 a.m. on Tuesday, April 24, 2018 at St. Maurice Catholic Church, 706 SE 4th St., Morrisonville, IL 62546 with Rev. Gerald Bunse celebrant. Memorial Contributions may be made to: Morrisonville Ambulance, P.O. Box 641, Morrisonville, IL 62546, or the charity of donor’s choice. Food donations may be brought to the Morrisonville Knights of Columbus Hall on Tuesday.